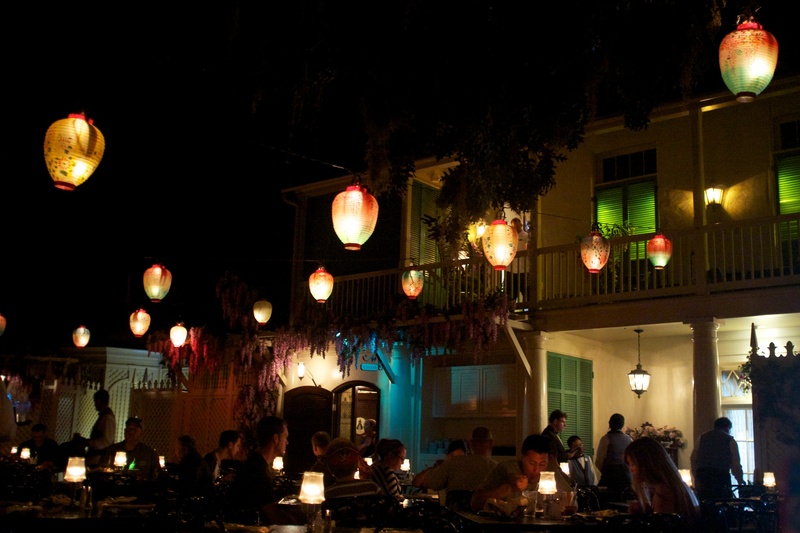 Nestled within the corridors of New Orleans Square and built into the Pirates of the Caribbean attraction, the Blue Bayou restaurant has been serving cajun creations to customers for the last forty-seven years. The restaurant opened on March 18, 1967 to meet the growing demand for a high quality restaurant in the park. The earliest menus featured the story of the Blue Bayou Terrace and such specialties as the Salade Rothschild and the classic Monte Cristo Sandwich. 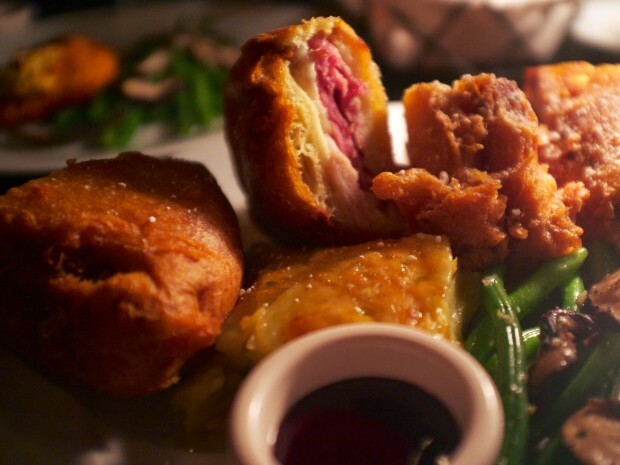 Over the years the menu has changed but one of the biggest draws for the restaurant is still the Monte Cristo. 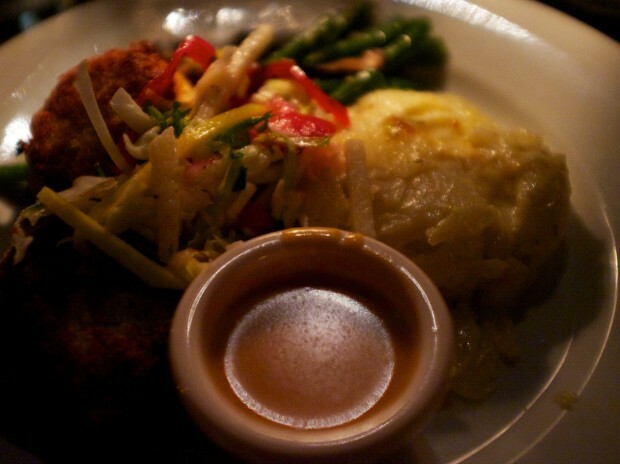 Reservations are highly recommended for dinner year round, and for lunch during peak seasons. The restaurant also designs unique holiday menus for Thanksgiving and Christmas. You enter the Blue Bayou next to the exit of the Pirate’s of the Caribbean attraction and the original Club 33 Entrance. After you have checked in, you wait inside a small indoor waiting area. The waiting area only seats about 20 people so people normally end up waiting on the floor or the stairs due to lack of space. A waiter will arrive from inside the restaurant, call you by name, and lead you inside. Once you walk up the wooden steps and through the white framed doors you are transported to the 19th century Old South. You are led to a black wrought iron table in front of an antebellum mansion. The best seats are the ones along the water, where you can see the beginning of the Pirates attraction and boats of other guests gliding by. As you begin to ponder your lunch or dinner selection, you will hear swampy sound effects like crickets, owls, and a lone banjo playing. All of these aspects combine to create the restaurant with the best atmosphere at the Disneyland Resort. The number one requested menu item is the Monte Cristo Sandwich. The classic Monte Cristo includes layers of turkey, ham, and swiss, which melt in your mouth as you bite into the golden flaky batter that coats the sandwich. Not to mention the amazing berry purée the staff provides you to dip your sandwich in. To top the meal off, if you ate at the Blue Bayou prior to Spring 2013 the sandwich would be served with a side of Blue Bayou Potatoes. The potatoes were made with cream, garlic and melted parmesan cheese. Today the sandwich is served with a fruit skewer as a “healthier” alternative. Let’s face it though, if you are eating a large meat and cheese sandwich that is deep-fried, dusted with powdered sugar, and then dipped in jam, are you really looking for a healthy meal? When I was growing up my family would always visit the Blue Bayou for lunch because my dad and I both loved the Monte Cristo which currently costs $25.49. For comparison, the classic Monte Cristo sandwich is also served at Café Orleans, except its only $17.99. Thats over a seven dollar difference for atmosphere and a fruit skewer. One of these is incredibly filling and and you could easily split with someone. For a small fee the Blue Bayou allows split plates. The entree is split and each person gets their own side, which is a pretty good deal. Editors Note: If you have a gluten allergy and book your reservations for the Blue Bayou at least a month in advance you can request a gluten free version of the Monte Cristo to be made for your reservation. It requires a special batter that the kitchen does not always have in supply, so the sooner you can let them know the better. Also if your in the mood to try something a little different you can get a three-cheese, no meat version of the Monte Cristo at Café Orleans across the way. One of the primary draws for dinner is the broiled filet mignon. Every-time I have ordered this dish it has always been cooked to perfection. The succulent flavor of the meat is in every bite and is paired perfectly with a béarnaise sauce. The sides include Blue Bayou Au Gratin potatoes which are cheesy with just the right sauce texture to sticks the slices of potato together. The asparagus are fresh and on only one occasion slightly undercooked. At $42.99 its pretty pricey these days. Now I do have a problem with a popular menu item for dinner; the Isla-Cruces Crab Cakes. At different times the portions were changed between an appetizer and entrée. Supposedly succulent pan-seared crab cakes topped with a lobster beurre blanc and mango slaw. I remember these nearly a decade ago being a representation of a properly constructed crab cake. Like nearly everything I review I give it two to three separate attempts before I pass judgement. My party tried the crab cakes three times over the past couple years (last time with Spring 2013 before the menu change), each time they were dry, burnt, and flavorless. For those with simpler tastes, or kids, the Mickey’s Cheesy Macaroni is surprisingly good. The noodles were covered in a cheddar cheese sauce that was similar to the rich sauce used in the macaroni and cheese at Flo’s in Cars Land across the way at California Adventure. The macaroni is served with steamed broccolini and fresh fruit. For an additional fee an adult can order off the kids menu and receive a larger sized portion of the specified dish. See this video review of every Blue Bayou Restaurant dessert menu option. The hosts ordered one of everything and present a review. No matter how young or old you are, there is always something that makes you smile. One of those things for me is the multicolored glowing ice cubes that Disney puts in their drinks. The drinks seem to taste so much better when they light up and glow. 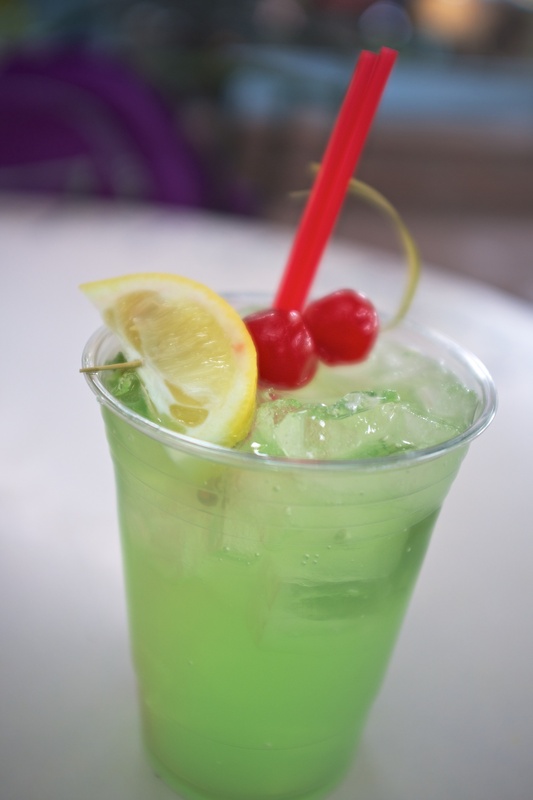 I was first introduced to this at ElecTONica in California Adventure and it works equally well with the Tinker Bell & Friends or Buzz Lightyear Punch. From my experience they give the kids straws with a glowing tinker bell or buzz lightyear. For the adults if the Louisiana Lemonade or Mint Julep is ordered you get the glowing ice cube. If you want an atmospheric dinner and want to get out of the hustle and bustle of Disneyland crowds the Blue Bayou is a great option. However with both the prices of food increasing in parallel with food quality decreasing, I will be eating my annual Monte Cristo at Café Orleans instead. I will only be coming back to the restaurant for special menus (holidays and promotions) and with friends who have never been. 5 out of 5 for atmosphere, 3 out of 5 for the quality of the food. Overall we give it a 4/5. Please share this Disneyland Blue Bayou review by clicking on the buttons on the side of the page and pinning the image below.